living in the margin of this relentless city. 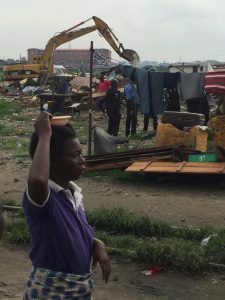 where some 15.000 people live, was demolished while it rained. in some places, the water in pools being dark. camouflage the sad look of Badia East. and Itedo, two small fishing communities. Tens of thousands of people lost their homes. Where they lived, luxury villas will be built. Some twenty million people live in Lagos. The vast majority takes part in the informal economy. 100.000 naira. That is a lot of money for most people living beside these railway. Komolafe from Fiwon principally rejects the evictions. However, at this moment, it is extra painful. and more common people have difficulty to make ends meet. have a virtual office’, he says with a somewhat bitter smile. arrested. They were being used during the demolishing of Badia East. the problem’, says Ibezim-Ohaeri. ‘Nothing changes.’ East Badia is being rebuilt. The court case between the inhabitants of Badia East and the federal government is months away. lived there, surely cannot afford. ‘Maybe a small part of the flats can be reserved for the poor people’, says Ibezim-Ohaeri hopeful.